This is the best visited contemporary artwork ever. In half a year two million visitors came to the Tate Modern in London, England to see the work. Many of them came back, two, three, four times and did something strange. Something you do not do in respectable museums. They stretched out on the ground, on their back, and often remained in this position for at least an hour. 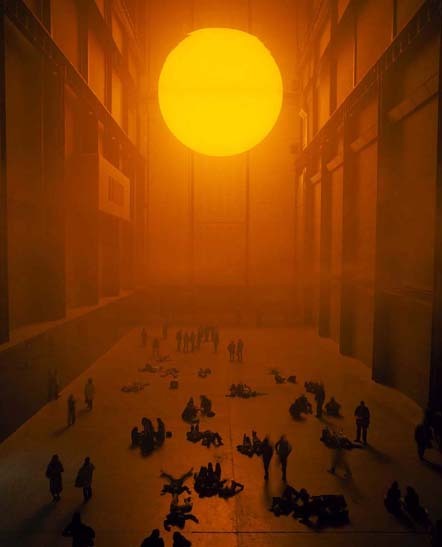 Olafur Eliasson is a Danish-Icelandic artist who acquired fame through The Weather Project. This installation is situated in an immense space of cathedral-like proportions, 155 meter long, 23 meter wide and 35 meter high. Just like the altar is central in a cathedral, the imitated sun is in the centre here, consisting of hundreds of mono-frequency lamps spreading a soft yellow glow. A fine mist hangs in the space, made from a mixture of sugar and water. Far above one sees huge mirrors. That is why people lied down. They wanted to see themselves high up there in the mirrors, an unreachable second self, somewhere in the sky, at a distance of 70 meters. Humans are images of God, the Bible tells us. Just like a king who leaves behind statues of himself all over his kingdom, so God left human beings behind across his realm. Where humans tread, there God has been first. Where humans tread, there is God’s territory. Don’t mess with humanity, for then you are messing with God. With Eliasson it is the other way around: we on earth are the originals, the copies are in heaven. As if we have been stored somewhere far away as a back-up in another world. Somewhere a memory of us will linger. According to one critic it was as if in the Tate the Apocalypse had started with all those people lying still on the ground. More and more scattered across the floor closer to the yellow ball, arms behind their neck, sometimes even with a cushion under their head, all staring mesmerized at their own reflection and straight into the fake sun. One of the great themes in art is ‘the sublime’: the ultimate religious experience of transcendence and unity. For some thinkers this is the highest art can achieve. For many people The Weather Project seems to evoke this experience. Perhaps it does this all too easily, even cheaply, like a kind of popcorn version of the sublime. In any case, the installation called up in many people a deep serenity, a feeling of rare magnificence and a surprising sense of satisfaction. At last this was a sun you could stare into. Although this sun may not have been for free, at least this was a sun you could endure. Perhaps this is the only kind of god we can endure. When the real God comes, the real Apocalypse will start. The only god we can keep staring at in this life is the image of God, a human God, Jesus. 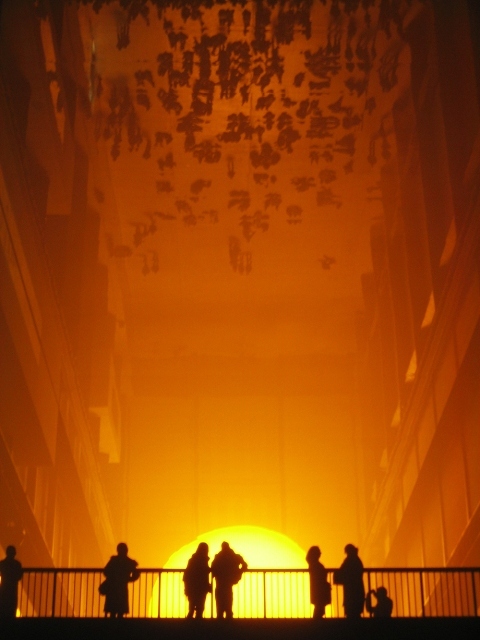 Olafur Eliasson: The Weather Project, 2003, mixed media, 155 meter long, 23 meter wide and 35 meter high.